Vivian, student of VEP tutor Pat Mapps, shares her classic American experience of dropping her child off at college! Congratulations to Esther and her family. Aug. 23, 2013, was the day that changed my family again. Since we moved to the U.S.A, this four-people family banded together. Our home country is Taiwan, our two kids were born there. 10 years ago, my husband’s job changed, we moved here. Because we didn’t have other family in the U.S.A, so all vacations, special moments, birthdays, graduations and some tough times, we had only our four to share it. After Esther left, life changed. Williamsburg, Virginia, this place is so colonial. 7 years ago was the first time we visited there. A 6th grade girl, Esther said “I hope someday I can go to this college.” when she saw the college of William and Mary located in the middle of Colonial Williamsburg. The dream has come true. After driving for five hours, when we arrived there, it was 2:00 pm. We were lucky to find a Chinese Restaurant for our empty stomachs and probably it was a last Chinese cuisine for Esther before she started to eat in the school’s cafeteria. After lunch, we got her Student ID, the room key and went to the financial office. Nice people and the campus was full of life at my first sight. My husband’s college mates knew this was not an easy time for us, so they were there for us from New York and Virginia Beach. We stayed at a beautiful family-style hotel in the Williamsburg Visitor Center. We planned a southerner’s dinner for Esther at Shields Tavern. When you go inside, you’ll be seated at a candlelit table and served the dishes from the 18th century. Steven, one of our friends, gave Esther a blue box with a Tiffany necklace. He said ” it’s a tradition that a Godfather gives the blue box when the girl turns 16th.” Even though he is not her Godfather, he knew what a special event this was for her. The big day was coming. Early morning, we picked up the stuff from Bed and Bath which we had ordered in PA and headed to school to help Esther settle in for her first year at William & Mary. 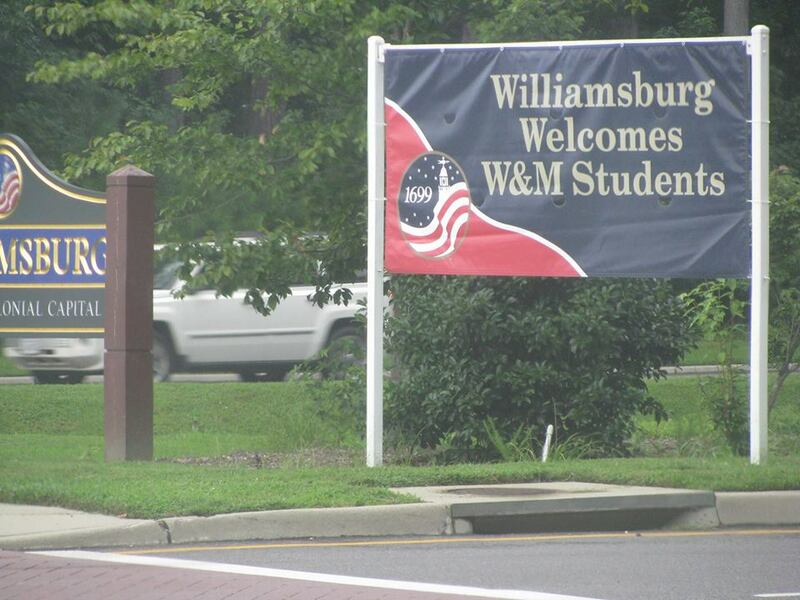 We saw many welcome signs, “Williamsburg Welcomes W&M Students,” that was exciting. The school was very nice to send many hands to help student and family move into the room. Esther’s room is on the 2nd floor, located across from the bathroom and beside the laundry room. Not big, but it’s enough to hold two girls. Emily, her roommate, is a beautiful Chinese girl who was adopted at 2 years old and grew up in North Carolina. Orientation was in the William and Mary Memorial Hall, thousands of students and family all gathered to celebrate this new page of a son or daughter’s life. After the ceremony, students and family were split into two groups to attend orientation sessions till night. For the next two days, we just tried not to think about Esther, instead to have fun with friends in the beautiful town. We walked in the colonial streets and took in the history of the 18th century. We learned how the people during that time made newspapers, how the court worked and how Capital Hall looked. Something that impressed me was the many workers dressed up and walking around. When you asked them to take a picture or said hi to them, they stopped and spoke as if we were living in the 18th century. One afternoon, we had High Tea in a hotel where Britain’s Queen also had the same High Tea. This was a special experience to me- beautiful china, fragrant tea, fine cakes and a lovely atmosphere. Sunday, before we headed back home, we met Esther again and went to worship together. I was so surprised, she seemed so mature. That moment I was so glad for her, even though I need the time to adjust. But we all know this step will be a big milestone in her life. As our next tutor training workshop approaches, I am reflecting on the quick learning curve our volunteer tutors. Each one makes a huge difference in the life of an adult immigrant by teaching English and American culture. When the new volunteers first attend the tutor training workshop, they are often apprehensive and unsure whether they will be capable of the job. Most of our tutors are not teachers by career, and they wonder if they will be qualified to really help. Every tutor really makes a difference. After they leave the 3-night training, they are armed with everything they need to begin tutoring. When they come to our office to meet their student, we spend an hour here introducing them and going over goals, books and lesson guidelines. They are ready! Brand new tutors immediately boost their student’s confidence and share cultural information, simply by being willing to help. They are sharing the language they speak every day. And very quickly, tutors develop expertise, as evidenced in the monthly tutor updates sent to us. One tutor, Sue, suggested to her intermediate level student to read a book that is just below her tested reading level, to practice comprehension. She found it improved her student’s confidence, showed her how much she already can read, and challenged her to tackle the next level. Just by spending time with the student, this tutor discovered an approach that worked. Another tutor, Carol, discovered a great use for texting with her brand new student. Scheduling meetings with her beginning level student via email and phone had left them both frustrated and disheartened. Most of us resort immediately to these because of their expediency. However, the messages were too complicated for her student. Her simple text — “Meeting on Tuesday from 10 am to 11:30am. Yes or no?” — was easily understood by her student. Carol got her confirmation, and her student didn’t have to worry about tripping over her words on the phone or in an email. Tutor Maggie realized her student was not putting the “s” on verbs that needed it, incorrectly saying “He walk.” and “She look pretty.” She focuses on this difficult-to-learn aspect of our language a little bit each meeting. Each and every one of our tutors has the natural ability to teach someone. And after training and meetings with VEP staff, they develop skills and an arsenal of techniques. You have something to teach, too! 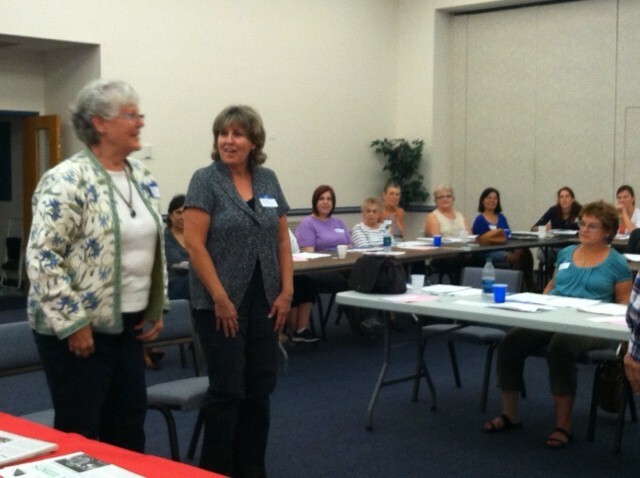 Won’t you consider joining us for the next tutor training workshop, to be held Sept. 12, 16, and 19, from 6 to 9 p.m., at Calvary Lutheran Church in West Chester. Click here for more information about the training and to register.